FNPF is transforming the Bali islands of Nusa Penida into a wildlife sanctuary where protection of the wildlife is provided from all 41 village communities. FNPF’s mobilization of all 41 villages to run community-based protection of birds has transformed the islands into a unique sanctuary free from poachers. Elsewhere in Indonesia, poachers are the greatest threat to endangered birds. The project has already saved the critically endangered Bali Starling, Bali’s emblem bird, from extinction in the wild. The cost and sustainability benefits of our holistic approach compared to other models is most evident in the success of FNPF’s Bali Starling Conservation project on Nusa Penida. Because of the continued threat from poachers elsewhere and the unique removal of the threat on Nusa Penida, this is the ONLY successful project to create a wild population of Bali Starlings in Bali. And now that we have gained the commitment of all villages to protect birds, we are working with the communities to extend this protection to other wildlife, including sea turtles. In 2011 we started working with one village on a remote beach to introduce sea turtle monitoring and protection. This is one of the few beaches that is not being used for seaweed farming and sea turtles are known to frequent this beach. In 2007, Susilo Bambang Yudhoyono visited Nusa Penida to open the new ferry. Bayu (FNPF’s founder) wrote to the president and invited him to join FNPF in releasing a batch of Bali Starlings … and the president accepted. 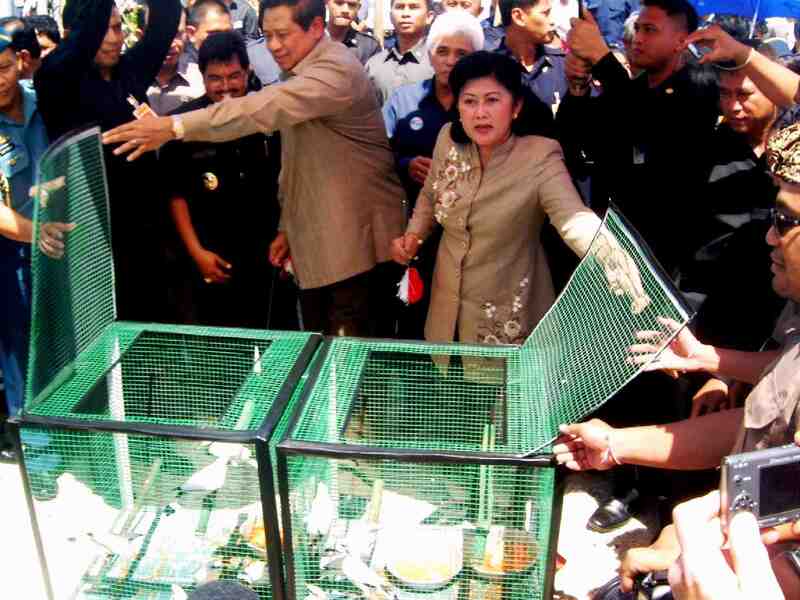 The photo above shows the president and his wife releasing the birds, with Bombom (from FNPF) on the right opening the cage. In addition to protecting the native wildlife, FNPF will also use this unique island sanctuary as a temporary release location for certain non-native birds (eg. that have been rescued from illegal captivity) so that they can relearn how to live in the wild, and/or rebuild a wild population, before being relocated by FNPF back to its native location in Indonesia.